American Beauty solder pots have industry wide recognition for superior performance. Includes dross skimmer that heats to solder temperature, thereby clearing solder without degrading temperature. Internal dross is moved to lip where it cinders away. Dross skimmers are safer and more efficient than paddles, spoons and sticks that contaminate solder and lower temperature. Interested in tightening your operating parameters? Please take a moment to examine our Model V3700 Voltage Control Unit which saves you money while improving your operations. Cast Iron Crucible - Chemically stable to keep solder pure. Wide Lipped - Perfect for accomadating fixtures. Superior Heat Control - Uniform solder temperature in crucible. Typical uses include tinning the ends of stranded wire leads, pre-tinning small electrical parts, re-tinning soldering iron tips and dip soldering small printed circuit boards. Ideal solder pot for reliable control of solder termperature in harsh environments at an afforable price. 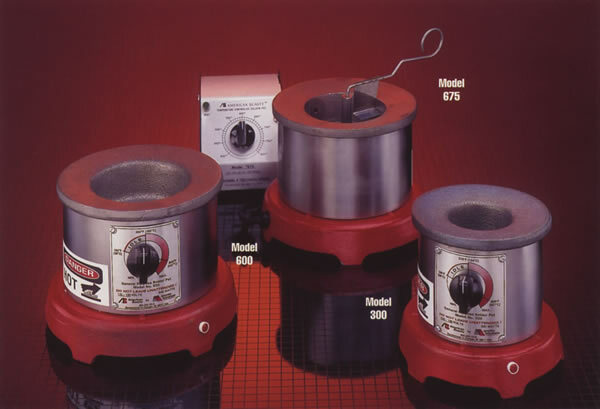 Very similar to the Model 300 solder pot except with more capacity. Typical uses include tinning the ends of stranded wire leads, pre-tinning small electrical parts, re-tinning soldering iron tips and dip soldering small printed circuit boards. Ideal solder pot for reliable control of solder termperature in harsh environments at an afforable price. Tinning the ends of stranded wire leads, pre-tinning small electrical parts, re-tinning soldering iron tips and dip soldering small printed circuit boards in environments where tight temperature controls must be kept. Tighter control without the costs involved with a digital solder pot. Temperature Variation - ±15°F after one hour settling time. Fuse - 7 AMP Type AG-3. Control Module: Solid state zero corss switching, opto coupled triac. Module can be placed upto 18" away from pot.